Charles Henry Brown was born in Gloucestershire in 1880 and came to Nottinghamshire in 1912 to work for Philip Huskinson Warwick as Coachman/Chauffeur. 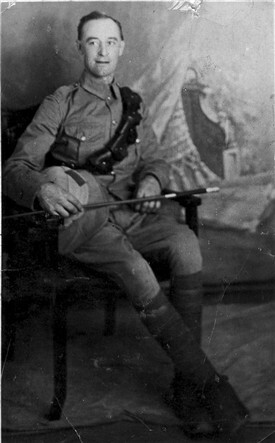 Philip Warwick had married in 1912, and it is presumed that this was when Charles Brown obtained his position with the family: He was to remain with them for 41 years. Philip Warwick was head of the large Warwicks & Richardson's Brewery on Northgate in Newark, although he actually lived in Southwell. In the 1911 census Philip Warwick is listed at Burgage Manor, and later on moved to Normanton Prebend in the town. From Southwell he was driven to the brewery each day by Charles Brown. When war broke out in 1914 Philip Warwick was a 2nd Lieutenant in the South Notts Hussars and seemingly Charles Henry Brown went in as his batman. Charles married in 1916 at Edingley Church and on the marriage certificate he is described as "A Soldier Bulford Camp" [Wiltshire]. It is presumed that his transfer to the Labour Corps occured after, and as a result of, this injury. After the war he continued working for the Warwick family, becoming latterly chauffeur and gardener. Philip Warwick (who had obtained the rank of Lt-Colonel during the First World War) died on 11th December 1954. His wife subsequently sold their home, Normanton Prebend in Southwell, and moved away to Chelsea. Charles Henry Brown, however, continued as gardener at the house under the new owners (a firm of property agents, until his death in 1960. 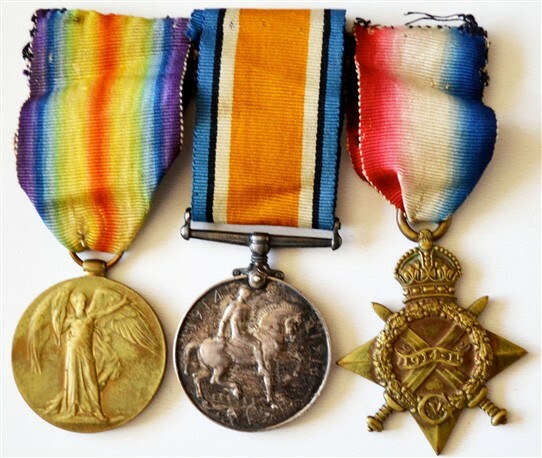 Medals of Charles Henry Brown of Southwell. Right hand medal is inscribed on back "1017 Pte. C.H. BROWN. S.NOTTS. 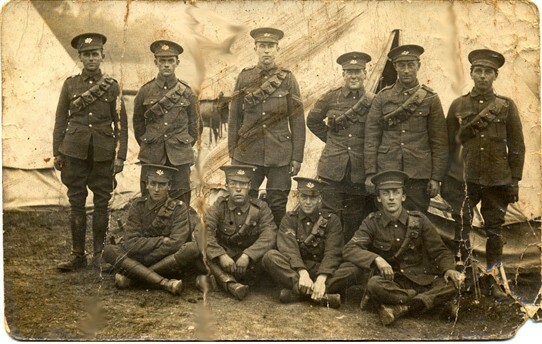 HRS [Hussars]"
Charles Henry Brown is pictured second from the right on the back row.